At Rocky Mountain Audio Fest 2015 Simaudio introduced its MOON products that have the airable.API integrated. The airable.API gives them access to many different sources of internet media. From music services to radio stations from all over the world, of any radio genre or music style. This meta API enables Simaudio to choose content offered by MOON products in a flexible and cost efficient way. It gives Simaudio the ability to adjust it’s products according to the consumers needs and market requirements. The comprehensive internet media offering and editorially curated content is easily navigated through the MOON companion app. 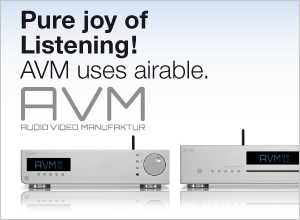 At the HighEnd show 2015 in Munich, AVM introduced their INSPIRATION and EVOLUTION streaming products with internet radio and on demand shows – licensed by airable -. Integrating the airable service adds more than 20.000 radio stations and more than 20.000 on demand shows to the AVM audio equipment. “Art for the Ear” is the Burmester motto. Each Burmester component has been developed with one goal in mind: to offer highest sound quality and absolute musical fidelity. Selected Burmester components utilize the airable internet radio catalogue.